He is one of the famous graphic designers in Japan. Yokoo descends from the murky overlap between art and design. His work, like that of many of his Japanese contemporaries, is exquisitely printed in small runs. 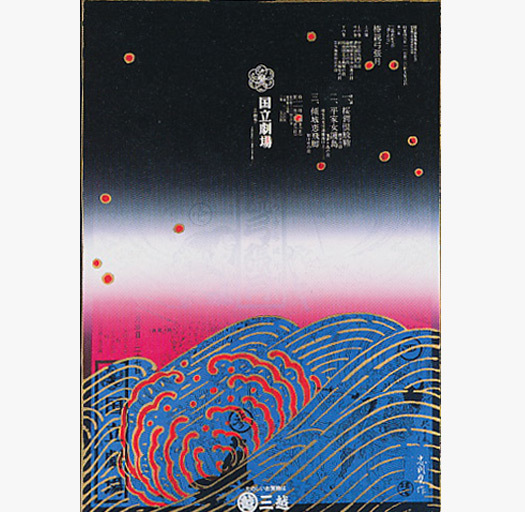 For example, his 1971 poster for the Bunraku Play of Chinsetsu Yumihari-zuki at the National Theater in Tokyo bears no resemblance to the dull offset theater broadsides seen in Europe or the U.S. A simple black background is overprinted with an outline of Hokusai’s “Great Wave” then printed again with a barely visible samurai battle scene. Holes appear as if shot through the poster in the upper regions, and details of the event are rendered in calligraphy. The technique that he uses is really unique, and his work crosses the border between design and fine art. Seemingly devoid of limitations or rules, his paintings are warm and mystical and draw on a variety of influences such as spiritualism, Japanese aesthetics, the psychedelic posters of the ’60s, science fiction, and comic art. It also consciously draws on Ukiyo-e, or “the art of the floating world,” whose themes express the impermanence of life.